Fraud and money laundering case launched against Navalny brothers | Russian Legal Information Agency (RAPSI). MOSCOW, December 14 - RAPSI. 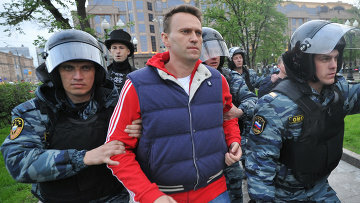 Investigators have initiated a criminal case against Alexei and Oleg Navalny on charges of fraud and money laundering, Investigative Committee official spokesperson Vladimir Markin told RIA Novosti. "Oleg and Alexei Navalny embezzled over 55 million rubles ($1.7 million) from a trade company... In order to legalize the illegally obtained funds, the Navalny brothers transferred over 19 million rubles ($620,850) under false pretexts from a fly-by-night company to an account belonging to Kobyakovskaya Fabrika Po Lozopleteniyu (Kobiakovo Willow Weaving Factory), also founded by the brothers," Markin said. While holding senior position with Russia's Postal Service, Oleg Navalny is accused of having "manipulated" a trade company into entering into a contractual agreement for cargo mail transportation with the Main Supscription Agency. 13:18 14/12/2012 Investigators have initiated a criminal case against Alexei and Oleg Navalny on charges of fraud and money laundering.